Download the Foloosi app and earn upto 50 AED Cash Rewards! Makes users complete their daily transaction in a simple, secure way and never limit payment options. 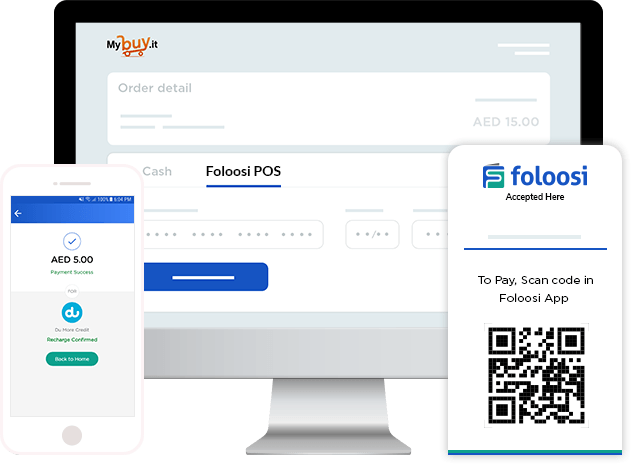 Users can pay for local and international services, utility and several other bills..
Customers can shop and pay directly from their own smartphones. Get activated and transact within 2 minutes. Completely online on boarding with minimum documentation. With plugins for all major platforms and languages, integrate and go live with Foloosi in less than an hour. Our innovative payment solutions with competitive pricing and no setup fee and annual fees. Business app will get instant notification once payment is completed successfully. Always available email, phone and chat based support to help you in your every step.